It’s been a busy few days which has included several new lesson plans, two batches of grading, and the normal day-to-day stuff, which helps to explain the silence in this space. However, despite this, I have been reading and writing (although more slowly than usual) and that’s what I thought we’d catch up with today. I happened to come across Angela Thomas’ debut YA novel called ‘The Hate U Give” whose plot revolves around a young African-American teenager who is in the same car as her (also AfAm) friend when they get stopped for a perceived infraction by a white police officer and the young man gets shot and killed. The novel moves forward in time as the young woman and her community try to deal with this situation with its murky causes. Although a heavy (and timely) topic, this novel moves along at a fast pace as it deals with the issue of police-related shooting, morality, race, and modern life in a city, and it’s probably going to make one of my Top Ten Fiction Reads this year. For once, the hype is worth it and I recommend that you pick this up at some point soon and then you can judge for yourself. Thomas does a great job of covering the multiple perspectives in such an incident without resorting to usual state of black-and-white thinking, and whether you agree with how the characters act or not, it’s probably going to leave you thinking once you’re turned that last page. I also learned the acronym behind Tupac’s phrase, Thug Life which (according to the author) means The Hate U Give Little Infants F**ks Everyone (or maybe Everything? ), meaning that it’s important to look after every person in your community whoever they may be. True that. With the semester fully underway, there have also been loads of events at the university including an entertaining talk by visiting Ruth Reichl, NYT best-selling non-fiction author and restaurant critic, which was really enjoyable. Plus, it’s play season on campus and we went to watch the one-act plays that students both write and perform. Good stuff. The blogosphere has been rather on fire about this short book of essays by the eloquent and passionate Rebecca Solnit. Solnit is an activist for a wide variety of social justice issues, and this quick read is a balm for the soul in terms of how to deal with 45 in the White House. It’s not a quick fix recipe book, but does have wise words for those who have been impacted by the ascendancy of 45 and his wolf pack, and how to help affect long-term change. If, like me, you’re a tad bit overwhelmed by the sudden 180 degree change in domestic and foreign policies which veer widely every time you wake up (it seems), Solnit has some wise words about looking at change in a long-term view and reminding the reader that all long-time societal impacts are usually composed of loads of small changes happening over a longish amount of time. You might not see the impact but small changes add up. One day on a lonely beach, one person saw that another person was throwing beach-stranded starfishes back into the sea. “What are you doing?” that person asked. A glorious and exuberant tour of a life steeped in books, Michael Dirda’s Browsings is a balm for the literary soul. Enough of such hyperbole, I say. But this was a good book, and Dirda is like having a very literate friend who seems to have read just about everything. Any time you read some Dirda, your TBR list is going to lengthen with books and authors who you didn’t even know existed. Michael Dirda is a Pulitzer Prize winning book review columnist who has written for a lot of elite pubs (including WaPo and NYT). He has a Ph.D. in comparative literature (including Mediaeval poetry) and yet writes in an inclusive yet scholarly manner. Not having an enormous background in Mediaeval poetry (and similar), I must own up to not being familiar with about half of the titles that he writes about, but he writes about these books in such an accessible way that you don’t mind. I think this is quite an achievement – that someone with such an academic background can make poets of the Middle Ages seem appealing is not for the faint-hearted. I may be going overboard in my gushing his praise, but I loved this read and I think you may as well. Don’t be put off if you’re not well grounded in long-forgotten esoteric titles – this will be happy hunting ground for you, I promise. Enjoy! This was a fascinating read about the troubling history of Native Americans in both the U.S. and Canada and written by an eloquent English professor who is also Cherokee (and Greek, as it so happens) so it was a perspective that was very unusual for me. It was also so interesting especially after having learned so much about the U.S. historical background of African-Americans last month. There are a lot of overlaps unfortunately – not the same, but definitely some issues in common. This title was actually more of a collection of thoughtful essays with the common theme of the history of Native Americans in Canada and the U.S.
Goodness gracious me – how this group has been mistreated by governments over the years. Coming as it does through the author’s eyes, it’s not a straight history but more of a conversation over coffee with the author, and I think that this worked really effectively as you, the reader, were exposed and immersed in the anger and frustration of the author as he reflects over the events. One of the Native Americans at a local tribal celebration here in West Texas. Essays covered a wide spectrum from how the early settlers set treaties with a particular tribe (and then broke them very easily) and this was a thread throughout the whole collection, really. It was tough to read the endless broken agreements over the years, and knowing this now, it’s more understandable to me how some of the Native American nations are mired in poverty, unemployment and other social ills. At one point, Canada produced a dollar coin that featured a totem pole with a raven in its design. Some of the Indian groups viewed this design as very insensitive and called this the “Death Dollar” as the raven is a sign of death for some tribes. Re: the Hollywood Walk of Fame (the stars in the pavement project): there are more cartoon characters and dog actors represented in this than there are Indians. There are only two stars for actors who were selected to play an Indian character, and one of those was actually Sicilian. There are more than 600 individual and recognized tribes in Canada and more than 550 nations in the U.S. There were two main foci to “handle” the Indians in the early years: Extermination or assimilation. Extermination of Native peoples was “acceptable” due to the concept of “Manifest Destiny” (i.e. “this new land is meant only for us” [i.e. Christians]). It was justified by the concept of “natural laws” and “survival of fittest” (twisting of Darwin’s evolution idea which was pretty new at that time). Assimilation: Indians were seen as “savages” who had “no understanding of orthodox theology, devoid of complex language and lacking civilized manners”. White people (and mostly religious groups) saw the savages as needing to be saved from themselves and made into the image of white people (or how they saw themselves). There was no compromise. King notes that land was “the defining element of aboriginal cultures” whereas for white people, land was only a commodity which had value only for what you can take from it or for what you can get for it. So – this was a powerful book that was really well written (although I would have like a bibliography). It wasn’t a scholarly book with footnotes or anything (and very openly reports that it’s not at the start of the book) , so through that lens, it really worked as a perspective of someone who has been in the trenches and knows of what he speaks. It was a fascinating look into Native Americans and their history. One of the Native Americans at a recent tribal celebration in Lubbock, Texas. When I happened to see this title at the library, I grabbed it as reviews of it have been all over the interwebs and I was curious to see how it read. Wow. It’s a provocative and challenging piece concerning race relations in the U.S. in the form of an impassioned letter from a black father to his son. Written echoing the narrative structure of James Baldwin (who wrote The Fire Next Time, a similar narrative addressed to his nephew), Coates writes a missive to his teenaged son on how to live life in America as a black man. It’s interesting to read, but wow – Coates is so angry about twenty-first century life for African-American people and seems to hold so little hope for life to change from his son. As a white person reading this short volume, his strong feelings against “people who believe they are white” took me a few steps back – “Wait a minute. I haven’t done anything to earn this invective”, and in fact, I felt so strongly that I actually put the book down to reconsider whether to continue reading it. After sleeping on it, I decided to pick it up again to finish the read and see what Coates’ total message really was. He. Is. So. Angry. He also seems to have little belief in any individual agency that people can change their lives for the better, blaming all (almost all?) of America’s recent ongoing racial troubles on the troubling history of entrenched cultural racism stemming from the years of slavery. But then I realized that I come from a background and history of never-ending white privilege. I have never had to deal with racism directed towards me in a negative fashion, so how can I judge whether Coates is over-estimating his views? I can’t, and I have no right to do so even if I could. He is entitled to his opinions and how he views the world, and I, as a privileged white woman, should pay attention to that. His opinion of life in America for POC was shocking and sad for me to read. No one should have to live in fear every day. The essay in this book is not focused at me, a white person who has not felt the daily fear of day-to-day life as an African-American person may well feel. As a white person, society usually reflects my race in the ads, the films, the books, the very life I lead. I can usually guarantee that someone who looks like me will be reflected back to me on the TV screen and similar, that I can (and am) living the manufactured Dream that Coates refers to: the Dream of green lawns, picket fences, and all the other fixtures of the American ideal. However, if I was a person of African descent, how often can one say that? How can I believe that Dream is achievable for me if I don’t see people who look like me in it? If I only read reports of people who look like me getting killed, incarcerated, addicted? It’s true that Coates is very angry about life in the U.S., and fears for his son and his future. Just witness the endless numbers of police shootings, black-on-black crime, poverty, unemployment, and disproportionate numbers of black men in the U.S. prison system, and one can’t rationally deny that racism is not alive and well in the world of today. If I was an African-American person growing up here, how could I not be angry at the way that America has treated me? I’d be mad as hell as well. So this was quite the provocative piece for me. By the time I had finished this fairly short read, I had definitely revised my views of U.S. race relations and of Coates. It’s an emotional piece of writing for me to read and I admire Coates in some ways. I wish that he did not feel so angry about the world in which he lives as there must be happy pieces in his world somewhere but there is no mention of that. He seems to have a very all-or-nothing view of the whole situation which seems to be rather extremist in some ways and to foster little hope for improvement on any level. But then I consider what he says about how America in the twentieth-first century is based on public policies which have their roots in slavery and segregation, and for me to deny that would be foolish. Of course life today is impacted by the life of yesterday. But how to change that? Should we take the perspective of recognizing what’s better and still continuing to strive for more improvements? Or should one take Coates’ perspective of “not enough, we deserve more and we won’t rest until we get it”? As a privileged white woman, the argument could be that as I’m already in a comfortable position, it’s easy for me to have the former perspective. Is it me being too much of a Pollyanna to view the world in that manner? Should I get my (white and idealistic) blinders off and more fully realize that life is still hugely affected negatively by race in the U.S. and, according to Coates, always will be? I think that that is the biggest strength of Coates’ narrative piece here: that his book invites everyone to take a closer look at how racism affects people (even if it’s not you), and how its insidious effects can chip away at a whole people one day at a time. It’s also a muscular “take no prisoners” letter to a son from a father who passionately wishes to protect and prepare him for his adult life. This ended up being a fascinating read which really opened my eyes about modern life in America for people of color. I recommend this book to anyone (wherever you may fall on the spectrum) as it will be certain to shake up how you see the world. And isn’t that the point of any good book? Coates, BTW, is the son of a former Black Panther and so understandably has strong views. Link this with Beyoncé’s SuperBowl half-time show, and it’s interesting to consider how this will all play out with a new generation. Food for thought, indeed. 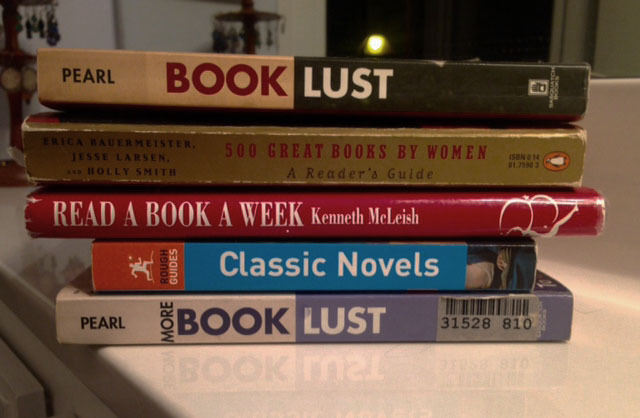 So – to the list of books about books (or reading or similar). Please feel free to contribute any titles that you’ve read and enjoyed as well. The more the merrier! 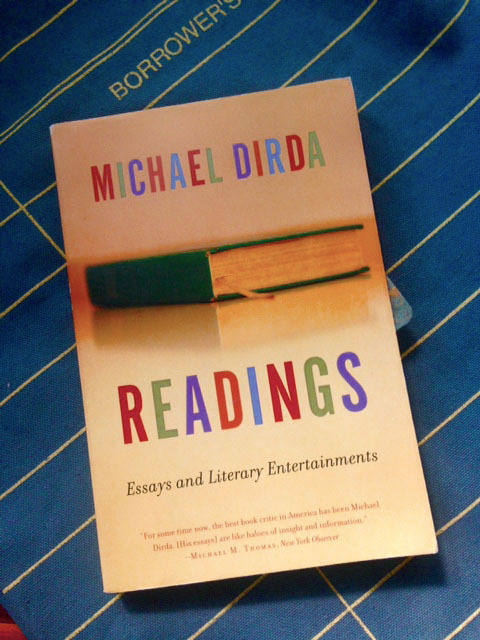 I’m currently immersed in Readings, a book of essays about books and reading from the excellent Michael Dirda. Swoon. Loving every minute of it even though he seems to have read every book in the English language. Good for the TBR pile.